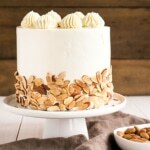 This Almond Amaretto Cake is a must for any almond lover! 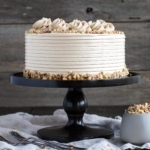 Almond cake layers infused with Amaretto liqueur paired with a classic vanilla buttercream. I was never a fan of almond flavoured cakes. I found them strong and perfumey, and generally didn’t like the flavour — at least of the almond cakes I had tried in the past, which I’ll admit, was not many. As it turns out, what I don’t like about almond cake is the flavour of almond extract. Amaretto is a whole ‘nother delicious level. Ryan and I were in London this June visiting family, and Ryan’s stepmother, Carol, suggested we try this famous chocolate and cake boutique called Choccywoccydoodah. I had never heard of it before, but there was no need to twist my arm — chocolate AND cake? I’m there. The name is crazy and the creations in the shop are even more so. It is amazing what they can do with chocolate! If you’re ever in London, it’s worth checking out. They have this little cafe on the upper level of the shop, so naturally we had to stop in and sample. We hadn’t even had lunch yet, but we were all pretty okay going straight to the dessert. Naturally, wanting to sample everything, I got this over-the-top 5 layer cake where each layer was different. The almond cake layer was my favourite by far, and since then I’ve had it in my mind to make a delicious Almond Amaretto Cake. In order to up the almond flavour, I added some almond flour to the cake batter. I really like the texture this gives the cake, but it’s totally optional. Almond flour is expensive, so if you don’t have any laying around, feel free to just replace it with flour. 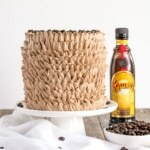 The Amaretto in the cake layers and the Amaretto syrup are both must-do’s in my opinion. It really helps to enhance the flavour, and the syrup adds amazing moisture too. I chose to pair this almond cake with a simple vanilla buttercream, but you could add Amaretto to that too if you prefer. If you’d rather make a non-alcoholic version of this cake, you can use almond extract instead, but use it sparingly. Almond extract is very easily overpowering, definitely a case where less is more. 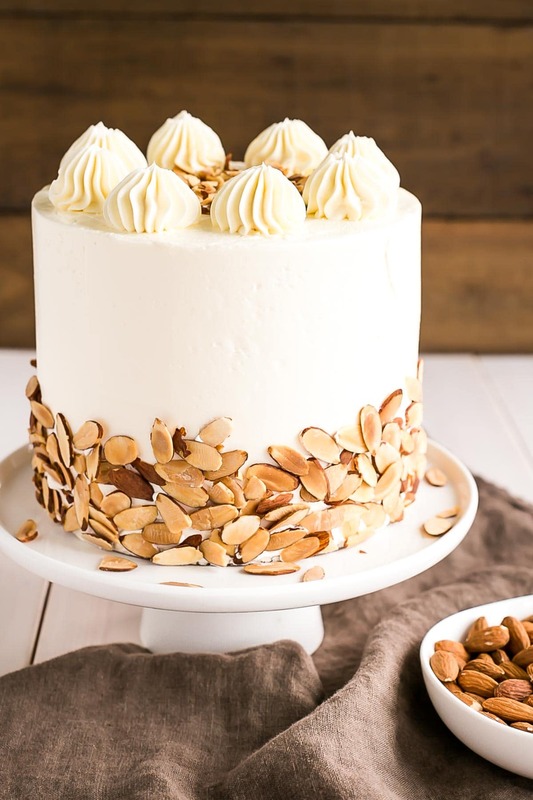 I kept the decoration on this cake simple — toasted almonds pressed into the sides, and some dollops on top with an Ateco 867 (or Wilton 6B) tip. 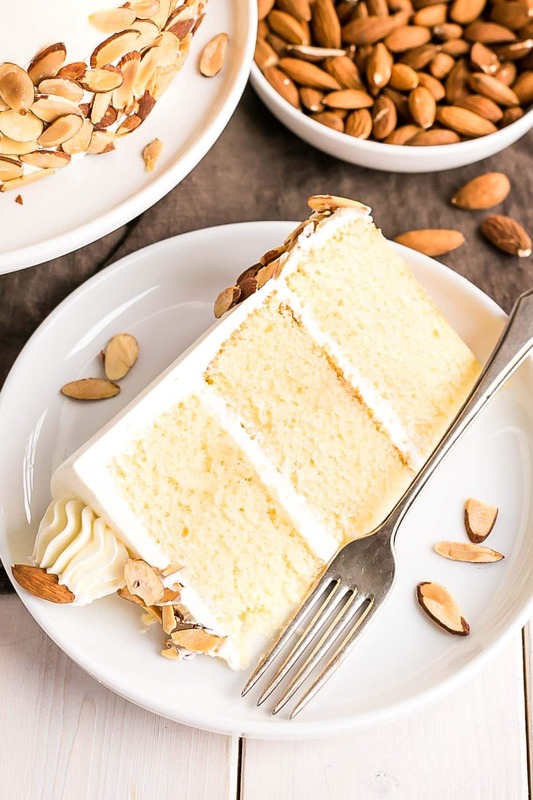 If you’re an almond lover or have one in your life, or if you’ve hated almond cakes all your life like I have and want to try something that just might convert you, this cake is a must!! Looking for more boozy desserts? If you don’t have almond flour and can’t be bothered buying it (I don’t blame you), you can just leave it out and increase the flour to 2 1/4 cups. If you prefer a non-alcoholic version, you can use almond extract instead. For the cake, use 1 tsp almond extract (at most) and increase the milk to 1 cup. For the syrup, use 1 tsp of almond extract instead of Amaretto. Almond extract is strong and it’s easy to overdo it. Less is more here. 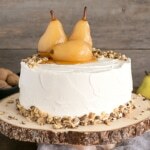 For nut lovers, check out my Pear & Walnut Cake, Ferrero Rocher Cake, and Walnut Cake. In a medium bowl, whisk flour, almond flour, baking powder,and salt until well combined. Set aside. Alternate adding flour mixture and milk mixture, beginning and ending with flour (3 additions of flour and 2 of milk). Fully incorporating after each addition. Switch to paddle attachment. Slowly add cubed butter and mix until smooth. ** Add vanilla and mix until incorporated. Trim tops of each cake layer just slightly (to help the syrup absorb). Place one layer of cake on a cake stand or serving plate. Brush generously with Amaretto Syrup. Top with approximately 2/3 cup of buttercream and spread evenly. Repeat with remaining layers. Frost and smooth the outside with a thin crumb coat. Chill for 20mins. Frost the top and sides of the cake and pipe dollops on top of desired using an Ateco 867 or Wilton 6B tip. 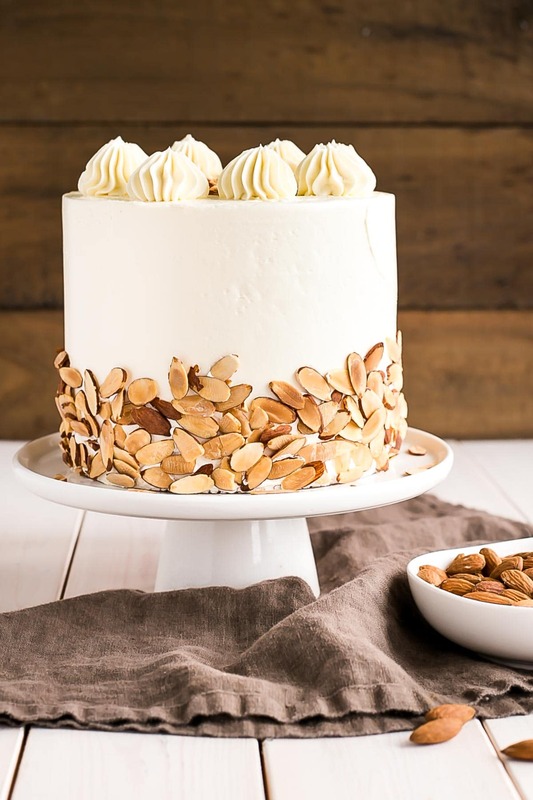 Press toasted almonds into the bottom and sprinkle on top of the cake. - If you don't have almond flour and can't be bothered buying it (I don't blame you), you can just leave it out and increase the flour to 2 1/4 cups. - If you prefer a non-alcoholic version, you can use almond extract instead. For the cake, use 1 tsp almond extract (at most) and increase the milk to 1 cup. For the syrup, use 1 tsp of almond extract instead of Amaretto. Almond extract is strong and it's easy to overdo it. Less is more here. Hi! I am planning on making this with amaretto “extract” flavoring and use the kid-friendly approach. Should vanilla still be used? Also, I am planning on using a salted caramel frosting for inside, maybe even the external buttercream flavoring as well – do you think I should still do the amaretto syrup? Hi Elaine! You could still use vanilla for sure, or leave it out — either way 🙂 I would do the syrup both for flavour and moisture still. I’ve noticed several questions on resizing, I wanted to do 3 9” pans with enough height to potentially slice for a 6 layer cake…would doubling the recipe be adequate or way too much, would 1-1/2 the recipe be better? Hi Cliff! Converting pan sizes is always tricky. Here’s a site I use as a guideline: http://www.joyofbaking.com/PanSizes.html I would 2x the recipe for three 9″ pans. Would it be okay to use amaretto creamer instead of liquer?? Hi Danielle! The flavour might not be as strong but it should work ok.
Hi I’d love to make this for an upcoming family holiday. Could I use almond cream cheese frosting instead? Also I have 2 8 inch pans. Should I bake two and bake the third layer in the pan when it’s cooled? Hi Susan! You could totally use almond cream cheese frosting instead — I think that would be delicious! The recipe as is will work for two 8″ pans. If you want three layers, then I would suggest whipping up another separate batch of half the recipe. It’s not good to let cake batter sit out once it’s been made. I hope that helps! I have made this cake 3-4 times and am having a terrible time with it. Don’t get me wrong…the taste is amazing! (That’s why I keep trying!). But the cake never seems to be done at 35 minutes. It takes much longer. The center then falls and after 45 minutes or longer in the oven (about the time it’s on the verge of burning), I remove it from the oven. Clearly not done in the center. At this point, I just crumble it in a container and pour the syrup over it…can’t waste such good taste! But I really want it in a formed cake state. What am I doing wrong? I follow the recipe to a tee. I have been using European butter (I believe it has higher fat content). Could that be where I’m going wrong? Hi Donna! That definitely sounds like something is off. Have you tested your oven temperature? Though it shouldn’t also be burning but then raw in the middle. It could be the butter – how much higher is the fat content? I recently had issues with a cake falling in the center due to using a nut flour which increased the overall fat. Also, are you at high elevation at all? That could contribute too. I followed this recipe with the exception of using two 9 inch pans for 2 layers instead of 3 and it came out wonderfully! Thanks for the great recipe! Awesome, thanks for the tip Carolyn! Hi Jessica! Good question, I did not pack it. I just spooned it into my measuring cup like I do with regular flour. Would love to see it being sliced! I’m afraid I’d make a mess of three layer but want to try. Hi Mary! I find slicing my cakes cold with a hot knife works best. Hi! 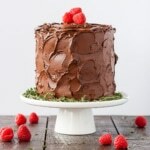 Can I use cake flour, or all purpose flour instead of almond flour? I can’t wait to try this cake! Hi Tessa! You can for sure but it won’t have as much of that almond flavour or texture. It will work though! Do you need to add flour for high altitude? If so, how much. I also had a problem with the cake falling apart. But the flavor is amazing. I want to pare this by stacking a white chocolate and almond amaretto cheesecake on top of the cake. This is for our 50th anniversary party. Hi Katie! I’m not totally sure, I’ve never measured it! But it would be around there. I made this cake and it came delicious! I brought a piece to my coworker who had just bought an amaretto cake for her birthday. She said that it was amazing! The frosting on this cake was the best I have ever had! I do not like frosting and scrape it off. Not this frosting! I’m making a three tier wedding cake. Does cake need to be refergirated if I use a basic white vanilla frosting ? Hi Laura! I’m not sure what you mean — refrigerated at what point? For how long? I want to make this recipe so bad! Is it possible to omit the frosting? By doing so, will it take away for the final flavor? Hi Susan! You don’t want to use any frosting at all? The cake will still be totally delicious, just less sweet overall. Hello! I am excited to try the recipe! However, I only have 9 inch pans. How long should I bake them for? Just made this today but frosted with a white chocolate ganache….it tasted wonderful but the cake falls apart very easily. It’s not dense or overly dry but it crumbles easily. Any idea why and how i can fix? Hi Anita! Is it possible that the batter was overmixed? That can happen sometimes. Or was your almond flour not very fine? Hi Rachel! Yes, it’s basically the same thing. Let me know how you like it! I want to make it for kids, what can i use instead of the liquor? Hi Caron! The notes section in the recipe and the tips above the recipe give instructions on how to make it kid friendly. Delicious everytime. I’ve been layering puréed fresh fruit between the layers for my friends who aren’t huge frosting fans and it’s just the best. 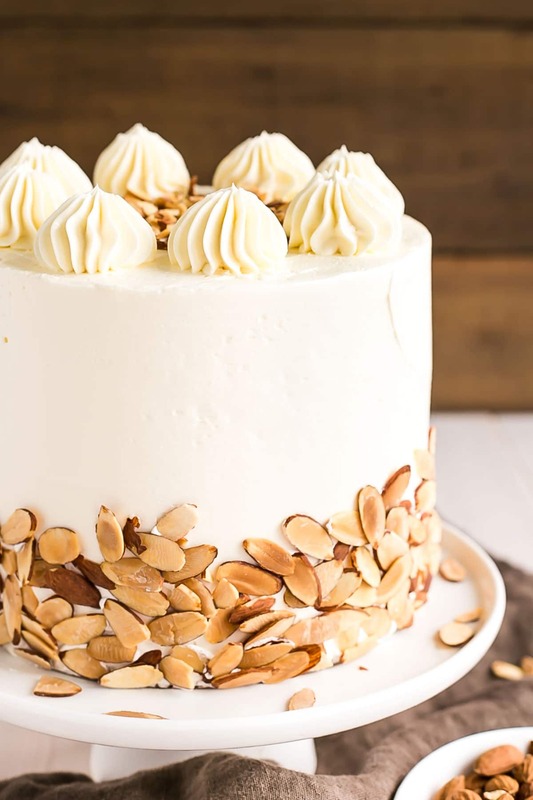 Almond is my favorite flavor and finally a good almond cake! 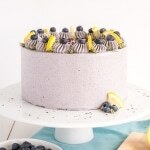 This cake has become a favorite, layered with fresh blueberries ans strawberries, Ganache, and swiss meringue buttercream. Topped with more berries, Ganache drip, and broken French Almond slice. Incredible. My customers are always amazed by the flavour combination. Now to attempt it with Frangelico and switching out almond meal for hazelnut meal. I love the addition of fresh berries to this recipe! Especially for summer. So glad you like it! I think a hazelnut version would be delish. I love the addition of raspberry!! Omg that will be delicious. I hope you guys like it! Hola! Traduje toda su receta, fue increíble!!! Gracias por compartirla. Saludos desde Costa Rica! Do you think this cake will bake well as cupcakes? Or will it come out to dry? Hi Marshall! It should be fine, but you’ll need to reduce the baking time. Start checking at 25mins. This cake worked great as cupcakes and the flavor is amazing!! I paired with a cherry Swiss meringue buttercream! Yay! So glad you liked it 🙂 Sounds like a delicious combo! I made this cake for a wedding and it was a great success. I made this cake 5 times and every time, it came out delish. I am going to try your vanilla and chocolate recipes next. Thank you so much for this fantastic recipe. 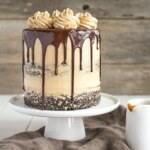 Wanted to bake this for a social event coming up this weekend and my schedule is a little flooded so timing to bake is tricky, would it be ok if I baked and drizzled one day and then frosted and reassembled the morning of the event? Or would that ruin the overall experience of it? Hi Samuel! Yes that would be totally fine. I often spread out my baking. Normally I’d recommend that you freeze the cake layers, but since it’s only a day between just wrap them in plastic wrap and leave them on the counter. I would recommend drizzling with syrup as part of the cake assembly, not in advance, though it won’t be a disaster either way 🙂 Let me know how you like it!! Do you think I could put an amaretto cheesecake in the middle layer? Hi Karen! I don’t see why not. You mean when stacking/decorating? Yes, I added the amaretto cheesecake in the middle when stacking, it was a success, very delicious cake! This looks amazing! Excited to try it, but I really struggle with making high altitude adjustments to cake recipes. Any suggestions for a high altitude version? Lol…that’s the same website I’ve been using. Guess I’ll just have to practice some more til I get it right. Thanks for taking the time to reply and for the all the great recipes! Lol, sorry!! What issues are you seeing when you bake your cakes? 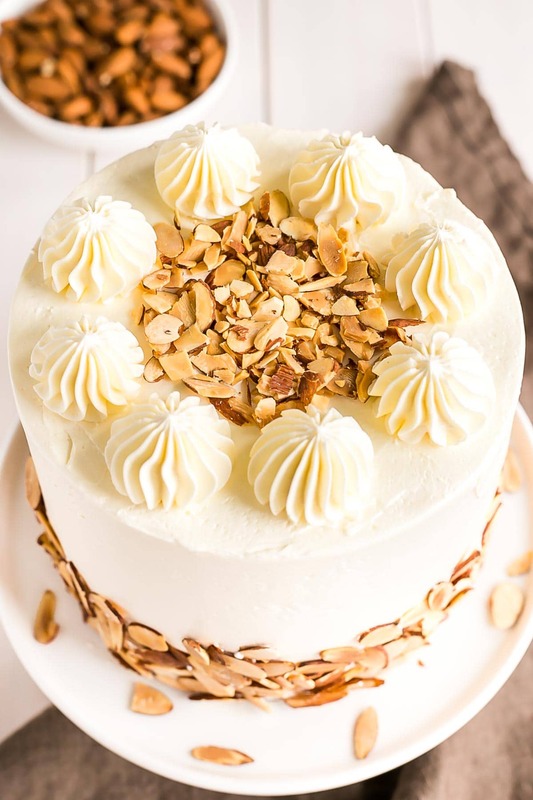 Attended an Italian-themed dinner party Saturday evening and, after convincing the hostess to allow me to bring a cake, we settled on the Almond Amaretto Cake. This was the sixth course of the evening (yes, 6!) and I couldn’t believe how many guests ate the entire piece of cake! It was incredible. Every time I make one of your cakes (this is my 4th) I think, “Oh, this is my favorite!” I can’t wait to make it again….but there are so many others to try! Hi Kim! You just made my Monday 🙂 Thank you so much and I’m so happy to hear that everyone liked this one!! It’s one of my faves for SURE. Hi Vany! Did the cakes sink in the oven or after you took them out? This flavor is AMAZING. I made it w/o modifications to the recipe, and it is very dense and almost greasy. Any ideas on whether I did something wrong or a possible modification? But I don’t want to modify too much, because the taste is exactly everything I could have hoped for. Hi Rachel! It shouldn’t have been dense or greasy, hmm. Overmixing can sometimes cause a dense cake, so make sure to only mix until the flour is just incorporated. Also, is your baking powder still good? Glad you liked the flavour, it’s one of my favourites!! This cake is wonderful. Made it for my moms birth Day and everyone loved it. One question though. Your image looks like the icing is dense mine was not so dense. What did I do wrong? If it’s one of the latter two then you can save it by sticking it in the fridge for 20mins and rewhipping. I hope that helps! This is one of the best cakes I’ve ever eaten. Had it for a birthday dinner and it was devoured by all! Wonderful recipe! Thank you! Thank you Milo! So glad you liked it! Does this cake need to be refrigerated if made a day ahead of serving? Hi Robin! Yes, I would refrigerate it but take it out 2-3 hours before serving. This looks lovely! About how many cups of batter does this make? I need to make 2 x 10” round with it. Hi Camille! I’ve never measured the volume. I use this site as reference for adjusting to different pan sizes (http://www.joyofbaking.com/PanSizes.html). Looks like you should double the recipe? This cake looks so beautiful! You are very professional and artistic with your photography, so lovely. I will look forward to making this recipe soon.I want to find 6″ pans and make it just to look the same way as yours. I hope I can achieve such pretty results. 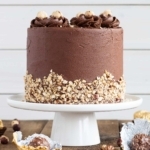 If this cake is a must for anyone who likes almonds, then it was created thinking of me, I love almonds and I put them and almost everything that, as you imagine a cake that takes almonds, should be all good.